As the largest point of sale VAR in North America, we represent a variety of products from NCR, Red Prairie, Radiant, Panasonic, Xpient, Par, as well as many others. We will work with you to understand what makes your business unique and what challenges you are facing. Then and only then will we talk about helping you find the right solutions. We team the right talent and technology to solve your challenges by developing a customized solution for you and your business. Providing a one source solution for our customers has contributed to our high degree of success. For over 63 years in business our more than 500 IT Professionals have been providing point of sale, back of house, enterprise solutions, installation services, hardware repair, software support and general IT consulting to franchise businesses nationwide. Our one stop approach has earned us the preferred provider status at top restaurant groups such as Arby’s, Culvers, Church’s, Dairy Queen, Firehouse Subs, Five Guys, Freddy’s Frozen Custard and others. Give us the opportunity to get to know you and your business better. Contact us at one of our offices to set up a short meeting to discuss your needs and our capabilities. Customized point of sale, Back of House, enterprise solutions, installation services, Hardware Repair, software support, and general IT consulting to Franchise businesses nation-wide. What makes this solution best in class? Solution Determination – Best in class hardware and software manufacturers enable RDS to provide you with a customized POS system. RDS performs a personalized needs analysis to help determine your business requirements and then helps you select which type of POS product will best fit your business. Solution Development – Customized POS solutions for your business. From creating databases, suggesting a process flow, order routing, to kitchen video, RDS will develop a solution to best suit your needs. Solution Training - Our training staff will come to your site and perform a comprehensive training session with your employees and management. 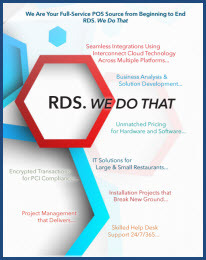 Solution Implementation - RDS’ installation team is trained not only on the hardware installation, but your entire POS solution omits the need for 3rd party contractors. Solution Support Nationwide – Highly trained support representatives provide 24 hour / 7 day a week software support in-house with in-house repair capability. Retail Data Systems has been a trusted vendor partner of Culver’s for over 27 years. They have been an integral part of our implementation, training, and support solutions as well as working with us on marketplace assessments and solution strategies. RDS has helped us shape our POS system needs from register layout to the installation process. We discuss solutions with the right people. They are receptive and engaged in our concept; always thinking about what’s coming in their industry and how it will impact Freddy’s.